With the introduction of the Deluxe Styracosaurus replica by our chums at CollectA, (due out in early 2017), Everything Dinosaur has taken this opportunity to commission a new Styracosaurus illustration to be used on the company’s Styracosaurus fact sheet. Our new illustration updates the existing drawing and gives Styracosaurus a row of bristle-like structures, running down from the hip towards the end of the tail, a feature inferred from a number of ceratopsid specimens but not confirmed (as far as we know), from the fossil record of the Styracosaurus genus. Whilst working in a school the other day, one of our dinosaur and fossil experts was approached by a member of staff and asked questions about a career in palaeontology. Their son is very keen on dinosaurs and would like to be a palaeontologist. Our fossil expert briefly outlined some of the numerous career paths available, including the role of illustrator. The boy is quite keen on drawing and loves drawing prehistoric animals, perhaps one day he will be able to combine his interest in dinosaurs and art and have a career as a palaeoartist. Scientific illustration is a very competitive area, however, as new dinosaur discoveries are made, the scientific community often relies on the skills of artists to bring the fossilised remains to life and create an illustration of the animal as it probably looked. We hope you like the Styracosaurus (S. albertensis) illustration, it will feature on our soon to be revised Styracosaurus fact sheet that is sent out with purchases of Styracosaurus models and replicas. Children in the three Key Stage 1 classes at Carrfield Primary Academy (south Yorkshire), have spent the second half of the autumn term learning all about dinosaurs, volcanoes and fossils. Working with the Cornerstones curriculum, the dedicated teaching team have been exploring all things prehistoric under the “Dinosaur Planet” scheme of work. The well-appointed and tidy classrooms have lots of amazing dinosaur themed examples of the children’s work on display. In class 1HJ, the budding young palaeontologists have been learning about bones and parts of the body by creating their very own dinosaur skeletons. Carefully crafted dinosaur skeletons on display in a Year 1 classroom. Outside of the Year 1 classroom, the teaching team have posted up “dinosaur fact flaps” featuring a massive Brachiosaurus, the plant-eating horned dinosaur Triceratops and the tiny, feathered meat-eater Microraptor. Some excellent examples of non-fiction writing accompany the informative dinosaur posters. Dinosaur facts and figures posted up by the Year 1 class at Carrfield Primary Academy. Under the inspiration tutelage of the teaching team, the children in the mixed Year 1/2 class have been creating dinosaur themed story maps all about their favourite prehistoric animals. We hope the tongue-twister we provided on the famous fossil hunter Mary Anning inspires the children to write their own prehistoric animal themed poetry. Schematic story maps are a great way to check understanding and learning. Being able to demonstrate evidence of learning as the children progress through a term topic is extremely important. These schematic story maps are a great way to check understanding and to test the children’s ability to recall information. Outside in the corridor, the pupils in 1/2LD have been looking at baby dinosaurs and studying dinosaur eggs. Paper mâché models of the eggs of dinosaurs had been created and if you look inside, you can see the baby dinosaurs waiting to hatch. “Out of the Egg” display by Year 1/2 children. The paper mâché models certainly made an “egg-citing” display. The children had also constructed volcanoes out of plastic bottles and paper mâché. Mums, dads, grandparents and guardians had been invited into the school to help the volcanoes erupt! The teacher in Year 2 with the help of the enthusiastic teaching assistants had been explaining about three-dimensional shapes. The challenge set was could the class create a Tyrannosaurus rex out of cylinders, cubes and cones? A three-dimensional dinosaur helps children to learn about spheres, cylinders, cubes and cones. The children made some three-dimensional dinosaur teeth out of clay, they could compare their clay teeth to the dinosaur teeth we showed the children in the workshop. What sort of three-dimensional shapes are the teeth of dinosaurs? We provided lots of extension ideas and suggestions plus some extra resources to help the teachers with their lesson plans as they bring this exciting dinosaur themed topic, a topic that has been thoroughly enjoyed by the teaching team as well as the children, to a conclusion. Professor Phil Currie (University of Alberta) is making plans for next summer, they include an expedition to hunt for a complete skeleton of the fast-running member of the dinosaur clade Deinonychosauria. Phil Currie is hoping to hunt down Troodon. With “the best-preserved baby horned dinosaur ever found”, but will Phil Currie find a Troodon? Troodontids are a group of small Theropod dinosaurs that seem to fall somewhere in the phylogeny of the Dinosauria between the ornithomimids and the fearsome dromaeosaurids. Troodon, may have been typical of this group, being fast-running, between two to three metres long (mostly tail), having a small skull with a long snout, large eyes and a big brain. Relative to its body size, the species Troodon inequalis has the largest brain of any mature dinosaur yet described. However, this genus is only known from a few specimens, and no complete skeleton of this dinosaur has ever been discovered. An illustration of the feathered dinosaur Troodon. A scale drawing of a typical member of the Troodontidae dinosaur family. Phil Currie, hopes to change all that and by doing so, help to assign with greater confidence, the various dinosaur genera associated with the Troodontidae family. The family tree certainly needs some revision, after all the Troodon genus was originally set up on the basis of the description of a single fossil tooth (albeit a very distinctive tooth). The famous Canadian palaeontologist, will lead a field team to the County of Grande Prairie (north-western Alberta, Canada) setting up a major dig in the Pipestone Creek area. The rocks in this area were laid down in the Late Cretaceous and a number of bedding planes contain extensive bonebeds. There have already been several important Theropod dinosaur discoveries made in this area, for example, earlier this year Everything Dinosaur published an article on the newly described, dog-sized, meat-eating dinosaur Boreonykus, which has been assigned to the Velociraptorinae sub-family of the Dromaeosaur family. The teeth, which are relatively small, are easily identified thanks to their very large, hook-like serrations. Isolated broken teeth are quite frequently found in the Grande Prairie area, but articulated bones and a fully intact skeleton are what the research team will be hoping to find. Bones and teeth that have been assigned to the Troodontidae family have been found across North America and also in Asia, but despite the wealth of fossil material (mainly teeth), Professor Currie estimates that 90% of the bones in a Troodon skeleton remain unknown to science. The Grande Prairie region could be just the spot to find the rest of the skeleton. Many of the bedding planes where fossils are found represent low energy environments, which can aid the preservation of tiny bones such as those from a small, fast-running troodontid. If lizards and mammals are preserved in these sediments then a three metre long, light and fragile Troodon might have been preserved too. In the summer of 2017, a field team will descend on the Pipestone Creek bonebeds with the aim of identifying small fauna. A team of Chinese palaeontologists, who have studied Asian troodontids are expected to join the researchers. The northern part of Alberta has proved to be a happy hunting ground for vertebrate palaeontologists with a number of significant dinosaur discoveries having been made in the area. The Upper Cretaceous rocks record important aspects of the region’s Late Cretaceous biota. It seems that during this time in Earth’s history, North America was connected to Asia and a faunal interchange probably took place. Several families of Asian dinosaurs have never been found in Canada, but Professor Currie is confident that one day, palaeontologists will uncover further evidence of this faunal interchange between the linked continents of Asia and North America. Team members at Everything Dinosaur look forward to reporting on the research team’s progress. Those talented people at JurassicCollectables have put together another dinosaur model video review. This time, it is the Schleich Barapasaurus dinosaur model that has been given a spin on JurassicCollectable’s turntable and what a fascinating prehistoric animal replica this model is. In this brief video (duration 4:19), the narrator talks through the finer points of this 2016 model, part of a range named by Schleich as the “First Giants”. In the case of Barapasaurus, this is an appropriate description, it was a sizeable herbivore, one of the biggest known from the Early Jurassic. Tentatively assigned to the Cetiosauridae family of Sauropods (whale lizards), it has been estimated that this dinosaur reached lengths of around fourteen metres. It is great to see a model manufacturer introducing a replica of a less well-known Sauropod dinosaur, especially one whose fossils are associated with southern India, a country that is proving to be quite a “hot-bed” for dinosaur discoveries, although, most of the specimens uncovered to date herald from strata laid down in the Cretaceous. In the video, viewers are given the opportunity to see this large model from a number of perspectives. The narrator looks at the carefully sculpted head in detail and comments on the skill of the model makers for creating such a formidable looking dinosaur model. As it is stated in the video review, we too would not want to meet Barapasaurus on a dark night! A very colourful dinosaur model. The narrator comments on the size of the model, estimating it to be over twelve inches in length and various props including “off-colour Alan” are used to give viewers an idea of size and scale. Special attention is paid to the colours used on this replica. It certainly, is a vibrant dinosaur model with its burnished reds and turquoise spots – a long way from the ubiquitous elephantine grey used in previous Schleich Sauropods such as their “Saurus” Apatosaurus, that was introduced in 2009. The 2009 Schleich Apatosaurus replica compared to the 2016 Schleich Barapasaurus. A close up of the head of the Schleich Barapasaurus model. JurassicCollectables have a wonderful YouTube channel which is full of dinosaur model reviews and other very informative and interesting videos. This YouTube channel has over 50,000 subscribers, that’s an amazing achievement, our congratulations to everyone at JurassicCollectables for such a fantastic YouTube channel. Visit the YouTube channel of JurassicCollectables here: JurassicCollectables on YouTube , Everything Dinosaur recommends that prehistoric animal model fans subscribe to the JurassicCollectables YouTube channel. Thanks, JurassicCollectables for your video review, Barapasaurus (B. tagorei) is one of our favourite Schleich models and it was great to see a video made for this dinosaur model. As Everything Dinosaur’s focus is on the Dinosauria, just one part of the vertebrate family tree, a tiny portion of the Phylum Chordata, we occasionally get reminded, usually by invertebrate palaeontologists or those scientists that specialise in studying micro-fossils, about the varied and diverse fossils of the Proterozoic Eon and the early part of the Phanerozoic (the eon of visible life). Today, we would like to focus on one group of highly significant fossils from the Paleoproterozoic onwards, stromatolites. The term stromatolite means “layered rock”, these are solid, rocky structures created by the activity of colonies of single-celled bacteria, mostly cyanobacteria, which were formerly known as blue-green algae. The bacteria live in mats at the top of the structure and they are very primitive organisms, whose fossil record dates back as far as 3.7 billion years, possibly (see note below*). Cyanobacteria are classified as prokaryotes, that is, they lack a nucleus and although regarded as “simple” forms of life, they were ultimately responsible for one of the most significant changes to our planet that permitted more complex life to evolve. Stromatolites photosynthesise, they use the sun’s energy to make food. As the stromatolites absorb sunlight they are able to break the chemical bonds in water releasing oxygen. At first, this free oxygen, reacted with the iron rich water to create iron oxides (rust) which formed the bands of iron ore that is mined today. Eventually, all the iron in the water was combined with oxygen, but the stromatolites kept producing oxygen as a byproduct of photosynthesis and it was this oxygen that began to increase the concentration of O2 in the atmosphere. This led to the Great Oxygenation Event (GOE) which increased the level of atmospheric oxygen, forming the ozone layer helping to protect the Earth from harmful cosmic rays. The increased oxygen permitted more biological diversification and speeded up the radiation of the eukaryotes (organisms with a nucleus) and the evolution of multi-cellular lifeforms. The cyanobacteria form structures by trapping sediment with their sticky surface coatings. The trapped sediment reacts to calcium carbonate in the water to form limestone. These limestone deposits build up extremely slowly, it has been calculated that one centimetre of structure takes around 25 years to be laid down. The photograph above, shows a view of Shark Bay, the most westerly point of Australia, one of the few places in the world where hypersaline conditions occur to permit the unrestricted growth of the cyanobacteria colonies. 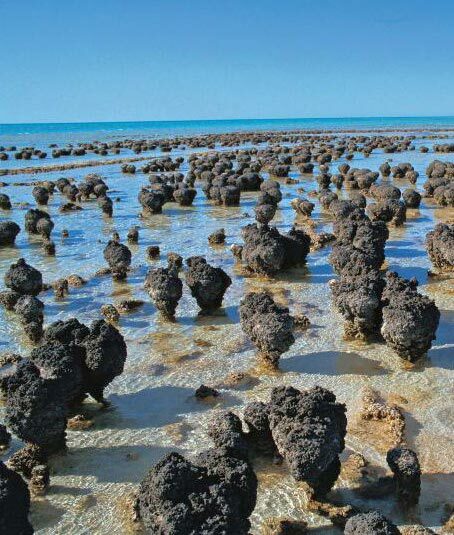 The stromatolites are found around the shallows of Hamelin Pool, which is located in the southern part of the bay area. Around 5,000 years ago, a huge bank of seagrass called the Fauré Sill began to impede the tidal flow into the bay, this led to a build up of salt in the water. The hypersaline conditions prevent most other types of marine animal from surviving, so the cyanobacteria have essentially, no predators. This area is one of the planet’s best examples of a living analogue for the study of life prior to the Cambrian faunal explosion. This part of Western Australia’s coastline has been granted UNESCO World Heritage status. The layered structure of the stromatolite colony can be made out in this fossil. In the rock record, stromatolites can be recognised by characteristic laminar structures, (layers). This is a cross section of a fossilised columnar stromatolite, it is very similar to those structures found in Shark Bay. Our thanks to all the cyanobacteria for helping to create the conditions to permit more complex life to evolve. Today, we reveal the last group of CollectA prehistoric animal models scheduled for release in 2017 and what an amazing group they are. CollectA intend to introduce a Dimorphodon pterosaur model with an articulated jaw, a Deluxe Uintatherium, a giant prehistoric mammal of the Eocene Epoch. Last but not least, CollectA are bringing out a box of mini prehistoric animal models, a wonderful set that features small replicas which we know will prove to be very popular with makers of prehistoric scenes and dioramas. The CollectA Dimorphodon model with a movable lower jaw. Flying into view or should that be walking into view, comes this beautiful replica of the Early Jurassic pterosaur Dimorphodon. This flying reptile figure is depicted in terrestrial mode, after all, these creatures did come down from the skies and in the case of Dimorphodon, it probably spent much of its time either on the ground or climbing around in trees. It is great to see a replica of this British pterosaur (not forgetting the possible second species from Mexico D. weintraubi), especially one that is shown in a quadrupedal stance, perhaps in recognition of the amount of research undertaken into pterosaur posture using Dimorphodon fossil material. The official measurements for the Dimorphodon are length 37.5 centimetres and height (wing tips) just under 12.5 centimetres. This model has been referred to as part of the “Supreme” range of models, but in other documents received from CollectA it is described as “Deluxe”. Whatever range it is in, the CollectA Dimorphodon is certainly a wonderful figure, and like the CollectA Supreme Guidraco pterosaur and the new for 2017, CollectA Deluxe Kronosaurus, it has an articulated jaw. Additional note: We can now confirm that the Dimorphodon replica is part of the CollectA Supreme range. CollectA has already introduced an array of top quality prehistoric mammals into their Deluxe scale model range and this new for 2017 Uintatherium (pronounced “You-inn-tah-fear-ree-um”), continues this trend. The information we have indicates a total length of 17 centimetres, with the height of the model around 9 centimetres. It makes a fine companion piece to display alongside the CollectA Daeodon and the CollectA Andrewsarchus figure, which was introduced earlier this year. Concluding the new for 2017 prehistoric animal models from CollectA is this wonderful set of twelve mini prehistoric animals representing a wide range of creatures from the Palaeozoic and the Mesozoic. These beautifully crafted models are going to prove to be really useful for model makers and creators of prehistoric animal dioramas, just to add those finishing touches to make a prehistoric scene look authentic and to add extra detail. The CollectA mini prehistoric animals set. The twelve figures, which are all marine animals, are comprised of three reptiles (Pliosaurus, Temnodontosaurus and the giant sea turtle Archelon), three fish (Leedsichthys, Dunkleosteus and the fearsome Xiphactinus) and six invertebrates. This is a fantastic set of prehistoric animal models and from our perspective it is great to see the likes of the Late Cretaceous straight-shelled ammonite Baculites and a replica of the giant Cameroceras, often cited as our planet’s first, monstrous super-predator, included. As to the size of these models, they do vary, with the largest models being just under five centimetres in length. When Will These Three New Items Be Available? We are expecting our first stock of the Dimorphodon, Uintatherium and the set of prehistoric animals sometime around the middle of next year. Places like the “Jurassic Coast” of Dorset, or the beaches that surround Whitby (North Yorkshire), might be synonymous with fossil hunting, but surprisingly, even some of our great cities can lay claim to be at the centre of palaeontological research. Take the city of Birmingham (West Midlands), for example, not the sort of place that one would immediately associate with fossils (the exception being the amazing Wren’s Nest site to the north-west of Birmingham, Britain’s first national nature reserve for geology). However, the study of a series of sandstone slabs, excavated from a quarry a few miles to the north of the centre of Birmingham is helping palaeontologists to plot global climate change some 310 million years ago, that led to the demise of amphibians and provided ideal conditions for the evolution and radiation of reptiles. By the Carboniferous the insects were already highly diversified and the lush forests and swamps were dominated by Temnospondyls (primitive amphibians). In 1912, schoolteacher and amateur botanist Walter Henry Hardaker presented a paper to the Geological Society of London detailing the discovery of a series of Tetrapod footprints and trackways that he had discovered in a quarry located in the village of Hamstead. Hamstead, itself has long since been swallowed up in the urbanisation of the area as the city of Birmingham expanded. The quarry too, has gone covered up as houses, shops and offices were built, after all, the quarry was located just a stone’s throw from Hamstead railway station. The sandstones became part of the Lapworth Museum of Geology’s fossil collection at the University of Birmingham. Hardaker, an alumnus of Birmingham University, probably would have been fascinated by the recent research work undertaken by third-year Palaeobiology and Palaeoenvironments MSci student Luke Meade (University of Birmingham) and colleagues as they applied 21st Century analytical techniques to reveal a glimpse of the world when reptiles were beginning to take over from the amphibians as the dominant Tetrapods. Using funding provided by the Palaeontological Association, the students scanned the twenty or so red sandstone slabs using state-of-the-art photogrammetric technology to provide a three-dimensional analysis of each track. Colour coding of the images permitted the research team to produce topographic maps showing the individual contours of each specimen. These three-dimensional images were then compared to other ichnofossils (trace fossils) to identify the types of animals which produced the footprints. The footprints and tracks provide a remarkable insight into vertebrate life during the Pennsylvanian Epoch of the Late Carboniferous. These trace fossils were formed as animals crawled over soft mud next to river channels. A subsequent flood event covered these tracks with sand and helped to preserve snapshots in deep time. The red sandstone slabs preserve amazing details, not only of the footprints and tracks but also raindrops and cracks in the mud that were formed as the area dried out. The research on these trace fossils indicates that the most common tracks were formed by amphibians, ranging from just a few centimetres in length (Batrachichnus salamandroides) to more than a metre long Limnopus ichnospecies). Other types of creature traversed the mud, leaving their tracks, animals such as large Pelycosaurs (synapsids distantly related to modern mammals). Although the tracks are much less common, their presence indicates that monitor lizard-sized Reptiliomorphs also roamed the swamps and low lying forest that was eventually to become the West Midlands of England. The three-dimensional models of the footprints that the team were able to recreate, led to the identification of these tracks having been made by the ichnogenus Dimetropus. Smaller reptilian tracks were identified as having been made by sauropsid reptiles, (Dromopus lacertoides), whose descendants gave rise to the crocodiles, marine reptiles, pterosaurs, dinosaurs and birds. Carboniferous footprints from the West Midlands (England) indicate the rise of amniotes. The photograph above shows a well-defined example of Limnopus isp tracks from the Hamstead quarry. The top photograph shows a dorsal view of the fossil material, (B) tracks rendered to show relief with an arbitrary scale, whereas, (C) shows tracks rendered to highlight areas of steep gradient, digitally isolating the outline of the tracks to aid genus recognition and cross comparison. Scale bar = 10 cm. This ichnofauna associated with the Hamstead trace fossils contrasts with the slightly stratigraphically older, more extensive and better-studied assemblage from Alveley (Shropshire), which is dominated by small amphibians with relatively rare Reptiliomorphs and Dromopus tracks are absent. The presence of Dromopus lacertoides at Hamstead, identified from this new study supports the theory that the world was gradually becoming more arid through the Late Carboniferous and different types of reptile were beginning to flourish. Hamstead quarry red sandstone showing trace fossils of the Carboniferous amphibian Batrachichnus. In the picture above, tracks made by the amphibian Batrachichnus salamandroides are shown, the red line indicates the direction of travel, the long thin lines are tail drag marks. As the world become drier, so those animals that did not have such a reliance on water compared to the amphibians would have had a distinct advantage. The synapsids and the diapsids being amniotes (they lay eggs on land or retain a fertilised egg within the female), would have had a significant evolutionary advantage over the amphibians that relied on returning to water to reproduce. The scientific paper: A Revision of Tetrapod Footprints from the Late Carboniferous of the West Midlands, UK (PeerJ). Xenoceratops foremostensis is a surprise omission from “The Princeton Field Guide to Dinosaurs” (second edition), a new dinosaur book that an Everything Dinosaur team member is writing a review about*. With all the amazing new, North American ceratopsid discoveries over the last decade or so we thought that “alien horned face” would be featured. Perhaps it is, but so far, we have not been able to find it, in what is a very well-presented and beautifully illustrated guide to the Dinosauria. A scale drawing of the horned dinosaur Xenoceratops. Fragmentary skull pieces were collected by Dr Wann Langston from the uppermost layers of the Foremost Formation (south-western Alberta, Canada) in 1958. Dinosaur fossils are exceptionally rare in this strata and what fossils have been found are highly fragmentary or represent individual, shed teeth. To understand why, you have to consider how the majority of the rocks that make up this Upper Cretaceous sequence, which is regarded as a basal component of the Judith River Group, were laid down in the first place. The sandstones, mudstones and shales that make up the majority of the strata (there are coal seams too), consist of sediments that were eroded from the mountain range on the west of the landmass of Laramidia. Rivers transported these sediments travelling eastwards before eventually dumping much of their load as the water courses slowed on a large floodplain prior to an estuarine habitat that led out onto the Western Interior Seaway. The fossils ascribed to Xenoceratops were found in a small band of rock which represented a riverine deposition area close to the shoreline. These unimpressive, scrappy remains were put into storage and not examined again until 2003. We have palaeontologists Dr Michael Ryan, Dr David Evans and Kieran Shepherd, the curator of palaeobiology at the Canadian Museum of Nature, to thank for the scientific description of this Centrosaurine, one of the oldest (if not the oldest), horned dinosaurs known from Canada. A thorough examination of the fossil material was begun in 2009 with Dr Evans locating further fossil material to be used in the study. This led to the naming of Xenoceratops (Xenoceratops foremostensis) in 2012. The dinosaur with “alien” headgear, but that’s now how this dinosaur got its name. Contrary to popular belief, this dinosaur was not named “alien horned face” because of its bizarre headshield ornamentation and its huge nasal horn. It was the first Ceratopsian to be described from the Foremost Formation and as it was a rarity, it was regarded as “alien” to the strata of south-western Alberta. A team of international scientists led by researchers from the Chinese Academy of Sciences in collaboration with colleagues from North Carolina State University and Linyi University (Shandong, China), have reported finding the oldest fossil evidence of beta-keratin and melanosome preservation in the feathers of a 130 million-year-old primitive bird from the famous Early Cretaceous Jehol Biota of north-eastern China. Writing in the journal “The Proceedings of the National Academy of Sciences (United States)”, this new study extends the time frame in which evidence of original organic molecules may be preserved and has provided new data on how to distinguish melanosome structures from similarly shaped microbes. This is the second article related to the melanosomes having been identified in ancient birds that Everything Dinosaur has published the week. The earlier article related to a bird fossil identified as a member of the Enantiornithes clade excavated from the Lower Cretaceous strata (Jiufotang Formation), that showed evidence of iridescence in its feathers. * It’s almost as if stories relating to melanosome structures in birds are flocking together! The Lower Cretaceous rocks exposed in the Chinese provinces of Hebei and Liaoning have provided palaeontologists with a huge number of vertebrate fossils to study. The fine-grained strata, laid down in a lacustrine (lake environment), surrounding by active volcanoes provided ideal body fossil preservation conditions and many specimens have revealed exquisite details. One of the most important group of fossils associated with these deposits are the many different types of bird fossil that have been found. This new study was carried out on the fossilised remains of one such primitive bird, a specimen of Eoconfuciusornis. Scanning transmission microscopy was undertaken to identify structures within the fossil and the surrounding matrix, chemical analysis including the use of antibodies that react to specific proteins, helped pinpoint the identity of the structures that had been found. The fossilised remains of a Lower Cretaceous bird from China (Eoconfuciusornis). What Sort of Bird was Eoconfuciusornis? Eoconfuciusornis was a crow-sized member of the primitive bird group the confuciusornithids that thrived in China during the Early Cretaceous. It was one of the first birds to possess a pygostyle (the last five tail vertebrae fused together) and to have a keratinous beak lacking teeth, features found in all modern birds (Neornithes). Previous studies had striven to prove that tiny, round or sausage-shaped structures preserved in association with fossilised remains were melanosomes, organelles found in animal cells that contains the light-absorbing pigment melanin responsible for colour and protection from harmful rays emitted from the sun. However, although melanosome-like structures had been discovered in a number of specimens, there was an element of doubt as to the authenticity of the research findings. It was difficult to definitively proved that these structures were not just microbes that had become associated with the feathers during decomposition and fossilisation. The scientists used both scanning and transmission electron microscopy to map minute details of the feather’s surface and its internal structure. They also utilised immunogold tagging, a technique which involves gold, non-reactive particles being attached to antibodies that bind to particular proteins in order to make them visible in electron microscopy. This helped to show that the fine filaments within the feathers were keratin. Confuciusornis sanctus a primitive bird but it had a beak. Further tests were carried out, including one which involved the mapping of the presence of copper and sulphur in association with the feathers when viewed under high resolution. Sulphur was broadly distributed, reflecting its presence in both melanin molecules and keratin. However, the distribution of copper (only found in modern melanosomes and not part of keratin), was only observed in the fossil melanosome structures. The data produced supports the identity of melanosomes and indicates that these structures are not the result of contamination or microbial action. If melanosomes can be positively identified within the fossil record and as the shape of melanosomes can provide an indication of animal colouration, then palaeontologists may be able to hypothesise with greater confidence the colouration of extinct animals including dinosaurs and primitive birds. The scientific paper: “Molecular Evidence of Keratin and Melanosomes in Feathers of the Early Cretaceous Bird Eoconfuciusornis”, published in the Proceedings of the National Academy of Sciences (United States of America). A team of international scientists writing in the open-access journal “GigaScience”, have published a paper that maps the genome of a “living fossil” – the Ginkgo tree. The extant Ginkgo (Ginkgo biloba), is the only representative of a division of the Plantae Kingdom called the Ginkgophyta. Native to China, this slow-growing tree with its distinctive fan-shaped leaves has a fossil record that dates back to the Permian. Also called the Maidenhair tree, Ginkgo biloba is the only living species of a once diverse and widespread group that thrived during the Mesozoic. The evolutionary origins of the Ginkgophyta are unclear, with the huge genome of G. biloba mapped, it may be possible to trace the ancestry of this enigmatic plant. A small Ginkgo tree (G. biloba). The genome of Ginkgo biloba has been mapped. A genome is a complete set of genetic instructions required to build an organism, allow it to grow, develop and function properly. The instructions are comprised of DNA (Deoxyribonucleic acid), which itself consists of four nucleotide bases adenine, thymine, cytosine and guanine (plus other materials that make up the DNA molecule such as phosphate and sugars). The DNA is contained in chromosomes, which are found in the nucleus of most cells. The four nucleotides are arranged in pairs, adenine binds to thymine and cytosine unites with guanine. The gene is the unit of inheritance, sections of the DNA consisting of an arrangement of the four base pairs make up a single gene and it is this gene that provides the instructions to build and maintain the organism. Each organism has a unique genome and the length of these genetic instructions varies. For example, the human genome is comprised of around 3.2 billion base pairs, if the genome of H. sapiens was printed out and put into paperback books, the stack of books would be over sixty metres tall, about as high as the monument to the Great Fire of London adjacent to London Bridge. However, the Ginkgo has a much bigger genome, consisting of approximately 10.6 billion base pairs. If the genome of G. biloba was printed into paperback form, the stack of books would reach over 200 metres high, that’s as tall as the giant cooling towers of the Fidlers Ferry Power station that dominates the Cheshire landscape. If the human genome and the Ginkgo genome were printed as paperbacks, the tower of books representing the Ginkgo genome would be more than three times higher. In the picture above, the human genome if printed out into paperback books, would make a stack some 62 metres tall. The much larger genome of G. biloba would make a tower of books over 200 metres high. A Brachiosaurus is shown for scale. The research team, which included members of the Chinese Academy of Sciences and scientists from Zhejiang University, are trying to find out why individual trees can live so long and how they overcome insect and fungi attacks. The Ginkgo genome mapping study is part of a much larger research project studying plant defences against pathogens. This investigation will help palaeobotanists to better understand the evolutionary history of the Ginkgophyta and how they relate (phylogeny) to other plant groups. The resilience of the Ginkgo has fascinated botanists. It has survived dramatic climate change including mini Ice Ages in its native China and Ginkgo trees in the Japanese city of Hiroshima were one of the few organisms to survive the atom bomb blast and resulting radiation, the oldest recorded individual tree germinated back in the Bronze Age. Ginkgo trees are also able to fend off attacks from insects, bacteria and fungi. The leaves contain an arsenal of complex chemicals that provide an effective defence. To better understand the Ginkgo’s defensive systems, the authors analysed the repertoire of genes present in the genome that are known to play a role in the defence of the plant. An initial analysis of the tree’s more than 40,000 predicted genes showed extensive expansion of gene families that provide for a wide range of defensive mechanisms. Genes that enable resistance against pathogens are often duplicated. In addition, Ginkgo trees have an extra weapon in their battle against Arthropods. As well as having their own array of insecticides within their leaves, they also defend themselves against attack by releasing volatile organic compounds that specifically attract enemies of plant-eating insects. The term “living fossil” is not one readily used by scientists. It implies that a species has survived unchanged of millennia. This is not true, the fossilised leaves preserved in Mesozoic and Cenozoic strata represent a wide variety of genera, but the tree’s basic body plan, its design has remained relatively unchanged for millions of years. This new data, indicating that the Ginkgo has a formidable array of weaponry to keep it safe from harm, defence measures that seem to have come about as the genes were duplicated, might be linked to the plant’s remarkable resilience. By undertaking a study of the Ginkgo and its genome, scientists may find useful pointers to assist them in helping to produce more robust crops that can resist diseases and pests. 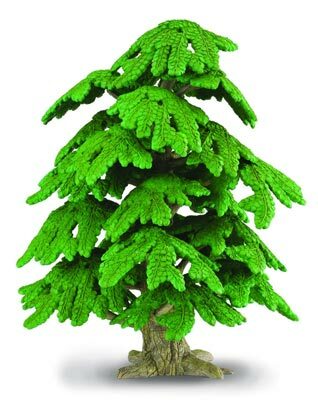 CollectA added a twenty-five centimetre high model of a Ginkgo tree into their “Prehistoric Life Collection” a couple of years ago. This replica works well with the 1:20 scale range of prehistoric animal models and is very useful when creating realistic prehistoric scenes and dioramas. The CollectA Ginkgo biloba tree model.